(Nanowerk News) For the first time, and using physical methods, scientists have demonstrated how red blood cells move. There had been real fights between academics over the question of whether these cells are moved by external forces or whether they actively “wriggle”. An international team of biophysicists from Münster, Paris and Jülich have now proven that both opinions are correct. Linking physical principles and biological reality, they recognized that fast molecules in the vicinity make the cell membrane of the blood cells wriggle – but that the cells themselves also become active when they have enough reaction time. This process can be defined exactly by comparing innovative experiments with new theoretical models. 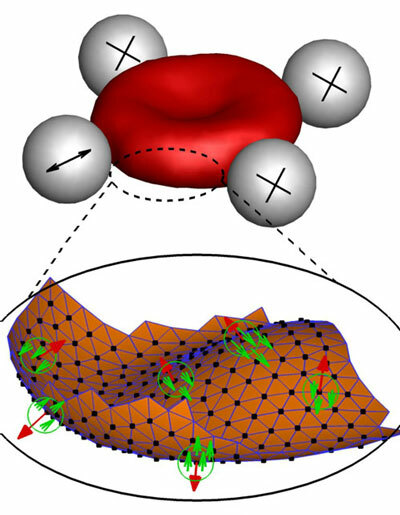 The study was published in Nature Physics ("Red blood cell mechanics violates the fluctuation dissipation theorem"). The function of red blood cells (erythrocytes) is to transport oxygen in the blood of vertebrates. Up to now, scientists had only seen the reason for their constant wriggling in thermal (i.e. external) forces. On the other hand, biological considerations suggest that internal forces caused by proteins are also responsible for the cell membrane in blood cells changing its shape. The researchers even have a suspicion already as to which forces inside the cell cause the cell membrane to change shape. “Transport proteins could generate such forces in the membrane by moving ions from one side of the membrane to the other,” says Prof. Gerhard Gompper, a Director at the Jülich Institute of Complex Systems. Timo Betz has been doing research as a biophysicist at Münster University since 2015 and is head of the Mechanics of Cellular Systems research group within the Excellence Cluster “Cells in Motion”. Research into the activity of red blood cells started as an international collaboration between the prestigious Institut Curie in Paris and two institutes in Jülich – the Institute of Complex Systems and the Institute for Advanced Simulation – and the work has now been completed in Münster, Paris and Jülich. “The key to our success was the interaction of Hervé Turlier’s physical theories, the computer simulations made by Dmitry Fedosov and Thorsten Auth, and my experimental results,” Timo Betz explains. The combination of experimental work, theory and computer simulations is essential for gaining new insights, says Gerhard Gompper. “Nowadays, modern simulations are able to quantify chemical and biological processes which do not lend themselves to direct experimental observation,” he adds. The researchers want to find out more about the mechanics of blood cells and gain a detailed understanding of the forces which move and shape cells. In the case of red cells in particular, it is important to know precisely about their properties and their internal forces – because they are unusually soft and elastic and change their shape in order to be able to pass through the sometimes minute blood vessels in our body. It is precisely because blood cells are normally so soft that, in previous studies, physicists measured large thermal fluctuations at the outer membrane of the cells. These natural movements of molecules are defined by the ambient temperature. In other words, the cell membrane of the blood cells moves because molecules in the vicinity jog it. Under the microscope, this makes the blood cells appear to be wriggling. Although this explains why blood cells move, it does not address the question of possible internal forces being a contributory factor. So the research team led by Timo Betz has been using a new method to take a close look at the fluctuations of blood cells. Using so-called optical tweezers – a concentrated laser beam – the researchers stretched blood cells in a petri dish and analysed the behaviour of the cell. The result was that if the blood cells had enough reaction time they became active themselves and were able to counteract the force of the optical tweezers. If they did not have this time, they were at the mercy of their environment, and only temperature-related forces were measured.